Sound Alliance, a jazz band, entered the stage. After taking their seats, they began to play. The trombonist, Randall Smith, and saxophonist, Jeremy Christiansen, passed the solo back and forth. Suddenly, the other instruments went quiet — Smith played alone. Despite the silence around him, Smith triumphs in his solo. The other instruments rejoined him for the final chord. “The concert was sort of an unprecedented thing that we decided to try in the Music Department where it was streamed — some of it was streamed from the Barrus concert hall to the I-Center. It was kind of a back and forth thing,” said Cameron Blackwell, a senior studying music education and the chapter president of the National Association of Music Education. The concert also featured some videos of performances, such as “And Can it Be?” from the Music Department’s YouTube channel. “The faculty just did an amazing job of putting it together,” Blackwell said. 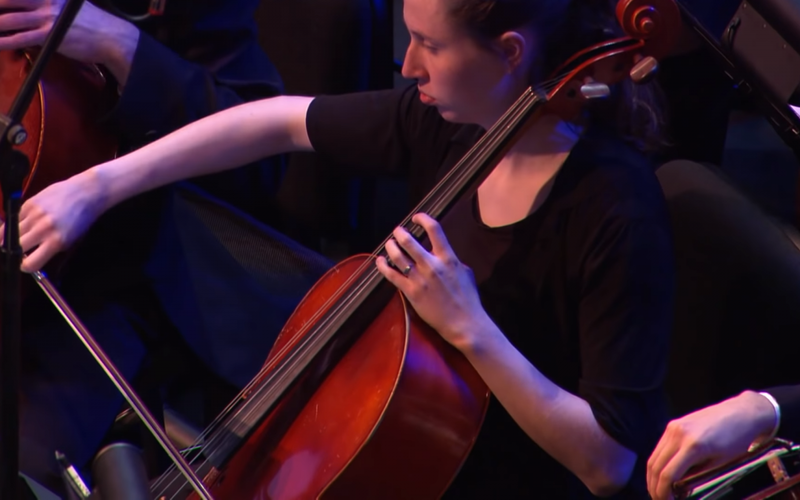 Their coordination made it possible for some performers — such as John Klein, a brass faculty member — to travel between the BYU–Idaho Center and the Eliza R. Snow Center for pieces. The only downside was that the performers based in the Snow missed the opportunity to watch the full concert. It’s “all part of being a music major,” said Elizabeth Watson, a sophomore studying music education. The concert also had multiple faculty performances. “I really liked the piano duet,” said Rachel Neal, a sophomore studying music. The faculty performances included a piano duet by Stephen Thomas and Michael McQuay, the Prismatic Winds and an organ solo by Daniel Kerr. Kerr’s feet danced across the pedals as he played “Variations Sur un Nël” by Dupré. “The organ was really cool (be)cause he has to play with his hands and his feet,” said Jean Blackman Harlow, an Idaho Music Educator’s Association conference attendee and Soprano I in the Allstate mixed choir. The conference included various classes and workshops for conference goers.